I love the concept of a capsule wardrobe: a small amount of well though-out pieces that mix and match effortlessly. I mean, I love it for other people. Not for me. Me, I love making clothes too much for that craziness. I'd love to do it someday, but today is not that day. But I gotta tell you, every time I'm putting away laundry for my boys, wow, do I wish they had capsule wardrobes! 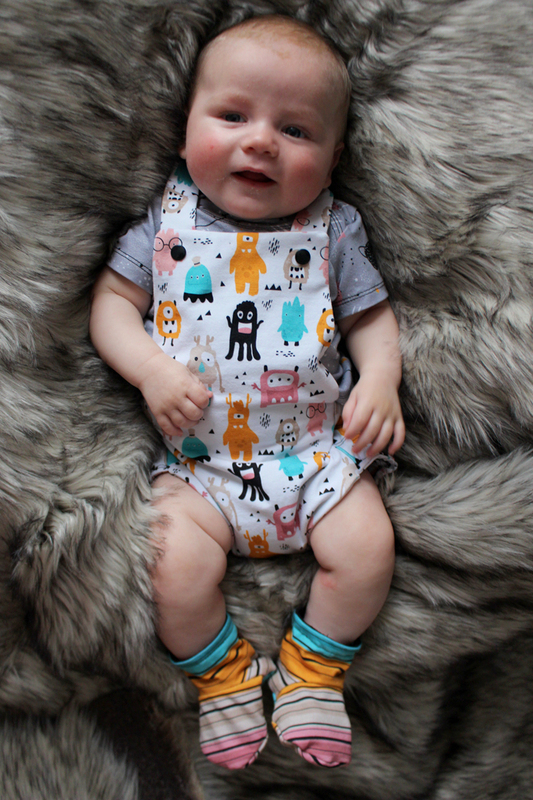 When RP Custom Fabrics sent me three fat halves of coordinating fabrics, I knew that I could make a super cute matching outfit for each of my three boys . . . or I could make Baby D one adorable mini capsule. So, I went with the latter. And when Sewing Blue Blog Tours (hosted by Made for Little Gents) asked me to join their Boys in Summer Blog Tour, everything came together perfectly! Alright! So with 1.5 yards of fabric, I was able to come up with these eight patterns, matched with one pair of ready-to-wear moccs. I did three each of tops, bottoms, and an "extra" (which ended up being the moccs, a pair of booties, and a hat). And yes, the bandana bib counted as a "top". He is a baby, and it is summer, after all! I reorganized the fabrics and patterns many times, until I came up with the perfect wardrobe sudoku (probably the funnest part of capsule wardrobes-- I love looking at the wardrobe sudokus!). Obviously, this is just a mini wardrobe, so nine items was perfect, but if you're doing a full, legit capsule, you'll probably want a few more items. Putting the pieces together sideways, up and down, diagonally and corners, you come up with nine outfits. Pretty cool, huh? I love the idea of bringing this whole capsule for a night away this summer- and being able to change a shirt or bottom if something gets spit up on, and still having him match! Perfect for a night away at the lake! And, since I'm the world's okayest mom, with the best baby ever, I had little D model each of the nine outfits. He's a trooper, that one. I love these fabrics-- the stripes, space theme, and aliens/monsters are so stinkin' cute. The colors are perfectly gender neutral. And I have to say, I'm a converter to the lap tee. . . so much so that I made two! I used to try to make "normal" shirts for my babies, but with those big, gigantic heads, lap tees really do make sense (thank you to Patterns for Pirates for converting me with their Free Wee Lap Tee). Poor kid. That was the last outfit, and I snapped one picture before I swooped him up and apologized. Let's see a happier face again. D is getting to the age where he loves chomping on anything- this Dribble Bib kept going straight to his mouth. Done with the baby overload? Good! Head over to all the other awesome stops on this blog tour-- all focused on the boys in our lives in the sweet, sunny, summertime!